One of the most crucial issues while playing any game of chance -including slots - Is the amount of money you spend for the game. No casino game is meant to make the player rich, on the contrary, casino gambling aims at gaining profit for the casinos. That is why to secure your funds it is extremely important that you apply an efficient money management strategy. We offer you the list of basic recommendations for slots money management. Tip # 1: Always set your bankroll before you start playing slots and try not to go beyond its limits in the process of gaming. Setting the bankroll means that you define how much money you actually can afford to lose in the game of slots. It is recommended to break your total bankroll into equal parts and set each part for every game session you are going to play. No slots guide will recommend you to use the money you win from the machine for next spins of the reels. 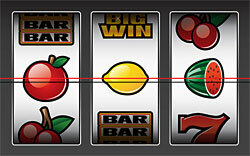 NB: In case your bankroll is low, you should rather play slots with a single slot machine payline and with three reels. Although these types of slots offer lower payouts, they pay out more frequently and you are still eligible for the highest jackpot. Tip # 2: Always choose machines that offer the highest payout percentages. Payout percentages are seen as the theoretical return of money to players in winnings. It is preset for each machine when it is manufactured and makes from approximately 70% to 98%. Tip # 3: If your bankroll allows, always play maximum bets on maximum paylines and with maximum amount of coins. Only this way you will be able to get the highest jackpot in case you hit the winning combination needed for it. Tip # 4: Be careful while playing modern video slot machines. Most video slots offer advanced graphical and sound effects, multiple paylines, extra bonus games and symbols, etc. Nevertheless, such slots are quite unpredictable, especially as they are run by the special computer program called the Random Number Generator (the RNG). The RNG defines the outcomes of each game by means of generating thousands of random numbers each second. Each number will correspond to a certain combination of symbols to come out on the slot reels. This means that the machine offers equal chances of winning and losing with each spin of the reels. The intervals between each winning spin in a bonus slot machine may be quite long, and it can happen so that the player wins nothing for the whole night at the slot machine. Tip # 5: You should always use your slot club card in case you have one. One of the common slot myths is connected with a false assumption that the players using their cards get paid less. In fact, if you don't use your card you lose the chance to get different comps (sometimes even cash back) from the casino. Possibly the most important recommendation on how to play slots and save your money is to remember that slots are a game of pure chance where the outcomes are irrespective of any previous game results and are seen as independent trials. That's why you shouldn't try to follow any false assumptions and be responsible with your money.